People land on cars. They just do. It’s how Daredevil and Crank end; it’s how Lethal Weapon begins. Pauly lands on a car in Darkman; Conan O’Brien lands on a car in South Park: Bigger, Longer and Uncut. And then there’s George Costanza’s suit against the hospital whose mental patient landed on his automobile. Clinicians call it the Evelyn McHale Syndrome, or at least I do. In December of 1941, Mrs. Charlotte Neill, 70, called the gas company to turn on service at 2536 Reservoir Street. The Gas Co. sent out Perry C. Butler, 48, who attacked her, causing shock and other injuries necessitating her hospitalization. Arrested the 26th, arraigned the 29th and free on bail, Butler was five days later, for some reason, atop the Subway Terminal Building. But not for long. It’s unclear as to whether he fell or jumped the ten floors and crashed to the top of a car on the roof of Savoy Garage. Assuming Butler jumped, it makes one consider that the auto is the modern equivalent of the sword, which Saul so famously fell upon after battling the Philistines. But consider: Detective Lieutenant B. G. Anderson was lead investigator in the apparent suicide attempt. Because Anderson was also, by coincidence, arresting officer in Charlotte Neill’s attack case, it makes one wonder if this particular car-landing didn’t have an element of the Ness/Nitti to it. Above, the Subway Termial Bldg at right, adjoining the low-slung Savoy Garage onto which Butler made his car-smashing plunge. Hats off to those contemporary “pulse-pounding” pictures what depict early-fifties dope and/or early-fifties Los Angeles for they are certainly the tingliest of films, though, let’s face it, they will never match the breathless, depthless pleasure of going straight to the source, of going straight to the Subject: Narcotics. Subject: Narcotics. Though no movie critic has ever heard of it, Subject: Narcotics is the Greatest Film Ever Made. Do not confuse this film with Narcotics: Pit of Despair (also the Greatest Film Ever Made) or even Narcotic, which is no slouch either. LA: one big shooting gallery. He lives from fix to fix and if he is lucky, he dies early, maybe from an overdose, maybe from an infected needle. And we turn and look behind him up to Third and Olive. Looming large and tall in the far distance The Palace Hotel, aka the Casa Alta, aka the Kellogg, at 317 S. Olive; below that, just at his shoulder, the Ems, at 337, and to the far left, the Olive Inn at 343. Narcotics have weakened his character. Ninety-nine out of 100 slip back. Alright already. Go watch Crime Wave. And don’t tell Ray Huber what’s going to become of society. When it rains, it pours. Which is probably a good thing, since rain will put out all that pesky fire. Corner of Fourth and Olive, August 29, 1962. Van R. Alexanian, 23, was loading a barrel of rubbish into the scoop on the front of his trash-truck when the parking brake gave way. The truck ran into an electrical pole, and the live wire caught the truck debris on fire. The pole then fell onto a Mrs. Helen Stairs, 50. The flaming truck went on to take out a traffic signal and a lamp post before crashing into a garage. This much was fortunate; the garage attendant was equipped with a fire extinguisher. Officer L. S. Rasic commented that had the truck continued through the intersection, it would have crashed into eight cars waiting for the signal to change. Should you wish to learn more about garages, please do so here. The Hotel Trenton, seven stories of sober brick laced with fire escapes, its yawning central maw somewhere between a gate of hell and a jaunty fireman’s doorway, lurked low on Bunker Hill for many decades. There it is at 10 o’clock in the panorama. It was not a racy hotel, but it had its moments, and left an imprint on the fabric of its times. And speaking of imprints, it was July 1905 when a lady guest of the establishment marched into to the Los Angeles Times offices to report her dismay at having ruined her long white skirt, white stockings and slippers when she walked over the streetcar tracks at First and Broadway and picked up a liberal helping of petroleum, which the cars’ operators had smeared on the rails to deafen the screech which otherwise came whenever a curve was taken. A snarky Times reporter noted that had the lady been as eager to lift her skirts when crossing the tracks as she was to show off the damage caused by the oil—"and it’s higher up, too! "—she would not be in such a predicament. In May 1906, town gossips received confirmation of a scandal, but too late to shun anyone involved. Some months earlier, Mrs. Genevieve Hughes arrived in Los Angeles from Denver and took rooms in the Trenton, where she was paid significant attention by fellow guest, Boston lawyer Charles W. Ward. Ward was briefly a Harvard man who took his degree from Columbia, a gymnast, a Knight Templar and a soldier, every inch the eligible young fellow… well, almost. Again and again he would ask that she marry him, and always she would demur—but not refuse his friendship. On February 28, Ward went into his room and shot himself in the head, and the whispers said it was out of thwarted love for Genevieve. The lady, however, had eyes for another, and quietly married A.G. Jones, also of Boston, departing for an Eastern honeymoon before news of the nuptials spread. And as for Ward, he was, it proved, a bounder, having left a wife and children awaiting the return of his health under the Californian sun. He lingered a few days after being shot, but died before his father could arrive by train. In November 1907, Mexican Secret Service officer (and soon-to-be fink in the trial of revolutionary countrymen Magon, Rivera and Villareal) Trinidad Vasquez left the safe harbor of the Trenton for a meal in a restaurant at Fifth and Olive. He had a ham and cheese sandwich and a cup of coffee, returned to the hotel and walked out again. In front of the Police Station, Vazquez was stricken with symptoms of poisoning and rushed to Receiving Hospital, where his stomach was pumped. Relieved, Vasquez testified that soon after eating he had felt a sense of suffocation, then felt as though his very heart would burst before blackness washed over him. He was soon released, doubtless with a greater respect for the fervor of the anarchist community of Los Angeles. In early February 1909 it was revealed that the Trenton’s recently hired night clerk Harry Stevens was in fact Florin G. Lee, a Riverside lad who’d suffered a breakdown from overwork (dry goods clerking by day, electrical engineering study by night) or, some whispered, love unrequited, on December 30 and fled his home, shaking off all memory of his former life. When confronted by old friends, who said they knew him well, Stevens/ Lee expressed astonishment, and mused on his happier times in Iowa and Butte, Montana, and his New Years Day rail trip to Los Angeles over the Salt Lake Route. Conveyed to Riverside, he looked with bemusement upon his aged grandmother and treated the rest of the family with cordial unfamiliarity. He did not recognize the shop where he clerked for nine years, the books he had kept (quite well) or respond to the music which he formerly had loved. For two months, the stranger stayed on in Riverside as those who loved him tried to spark a memory of his past life. And then suddenly, on April 2, while in the dry goods store where he had long labored, Florin’s memory of his accounting work came flooding back. He raced to San Bernardino to share the happy, mathematical news with his father, and we hear no more about him. On the evening of August 6, 1912, an "elevator pilot" was sent down to the basement to fetch some ice water. On the way up poked he his head out as the cage made its ascent. The ice water went everywhere, and so did the poor lad’s cranium. So complete was the destruction that there was initially some confusion when night clerk E.G. Merrifield came on the scene as to whether the dead man was Charles J. Oberman or his colleague, Earl Ansley. The victim was actually, it transpired, Earl McDonald, 18, from Riverside, who was moonlighting under the name Earl C. Ansley at the Trenton and working a day shift at the Hotel Victoria at Seventh at Hope. It was his first night on the job, and hotel manager R. Hughes was later charged for violating the state law requiring all elevator operators be properly licensed. On February 3, 1913, S. W. Westmeyer, a successful mining man from Globe, Arizona, visited his wife at the Trenton and wrote her a check for $1025. From there, he went to the Hotel Redondo in Redondo Beach, where, the following evening, he shot himself in the head. Westmeyer left notes giving his personal effects to his wife and asking that his Lodge, Rescue No. 12 of the International Order of Odd Fellows in Globe be notified of his passing. 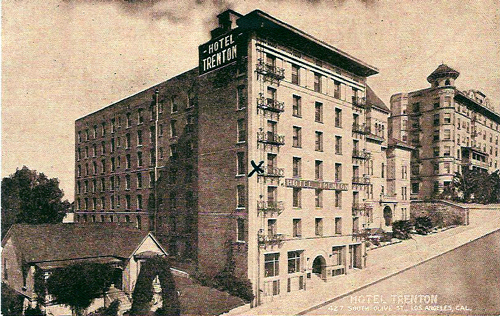 Later that month, the Trenton figured in the notorious jury tampering case of the great attorney Clarence Darrow, who rang up large charges at the hotel for select jurymen, far in excess of the $9 weekly rate that investigators were quoted—though it was the thirty dollars in ten cent cigars that got the jury’s goat. In October 1915, resident Marie Kinney announced that she was moving her dressmaking parlor from the Fay Building at Third and Hill to the Trenton, and noted that help was wanted. A year later, she announced her winter reopening in suites 102-103-104, crowing "choicest novelties in stock." Marie must have liked the place, for it was still her home on Valentine’s Day 1941, when, aged 80, she stepped in front of a Pacific Electric car on Huntington Drive near Poplar in El Sereno, and was killed instantly. Her rosary was said at Cunningham & O’Conner at 1031 South Grand, requiem mass held at St. Vibiana’s and she was interred at Calvary. In October 1917 the Los Angeles Division of the Collegiate Periodical League began a monthly drive to collect 5000 magazines, none older than ten days, for distribution among the servicemen at Camp Lewis. Among the district captains was Mrs. Alice M. Bryant of the Hotel Trenton. Your blogger will now attempt to staunch the drool inspired by the thought of what was gathered. Late on December 2, 1930, the Trenton was among a trio of downtown hotels robbed by a pair of bandits in a taxicab. After they hit the Stillwell at 9th and Grand for $30 and a pair of guest handbags, unknowing driver George Kruger waited patiently outside the Trenton while night clerk A. E. Finnity and manager Herbert Perry were relieved of another $30. Finally the Victor Hotel at 616 South St. Paul was victim, and again yielded up a lucky thirty simolians. The thieves then paid their ferryman and slipped off into the night. By 1933, we note that rooms were being let for a modest $3.50 a week. On June 8, 1936, Arnie J. Powers, 42, shot himself to death in his room, having failed to recover his health after coming out from Omaha. On June 14, 1937 the Trenton hosted its most eloquent suicide, when retired schoolteacher Mrs. Ida Mae Mills, 70, gassed herself with a chloroform-soaked rag alongside an open copy of the book The Right to Die. Her note read, "Remember this—Death should be a smooth finish, not a jagged interruption. There is nothing mysterious nor dramatic about this. Neither was it conceived in a moment of desperation. I think I am as sane as I ever was, but I have long been convinced of the wisdom of mercy killing. Why must I live on, tortured by constant pain, and facing total blindness? My abject apologies to the management for the trouble I am giving them, but I had to have some place to die, didn’t I? I could not vanish into the air." 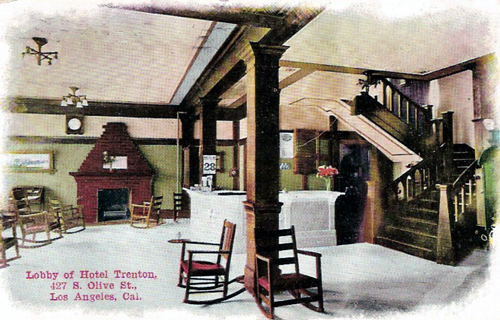 She could not, but sometime in the early 1960s, it seems, the Trenton Hotel did just that. We can only assume the CRA had a little something to do with that. Postcards from the Nathan Marsak Collection, Vasquez and 1908 advertisement from the Los Angeles Times, panoramic photo from the Los Angeles Public Library. When we last discussed the Fremont Hotel, we took a look at the antics of some of the hotel’s residents over it’s five decade existence. This time around, the Fremont employees get to bask in the OnBunkerHill spotlight. 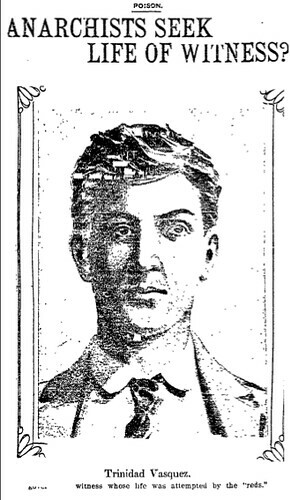 First up is Harry Stewart, the Fremont bellboy who was arrested on grand larceny charges in 1903. Apparently Mr. Stewart supplemented his income by stealing valuables from the rooms of hotel guests. The jig was up when a valuable diamond pin was removed from the room of Owl Drug president D.W. Kirkland (who would live out his days at the hotel). While the jewel was not recovered from the bellboy’s living quarters, some other items were discovered, including a sock. For some reason, Stewart had also lifted the sock from Kirkland’s room and left behind its mate. The footwear was enough to implicate him in the crime and he served the next six months in jail. Upon release, the former Fremont bellboy just couldn’t give up his wicked, wicked ways and was immediately arrested again for stealing five bucks out of a purse. Next is S.J. Messing, a clerk at the Fremont Hotel who was arrested in 1910 for embezzlement. It seems that Messing had had a business partnership in San Francisco the previous year and his partner, Frank Smith, felt he had been embezzled out of a whole $25. Mr. Smith felt so wronged by his former partner that he repeatedly had Messing arrested, hoping the charge would stick. The first arrest came when Messing was recovering from malaria in a Napa hospital and the second arrest occurred while he was enjoying a show at the Orpheum. The final time came when Messing was in his bed at the Fremont. He was taken out of the hotel all the while proclaiming his innocence and swore he would go back up to San Francisco to clear his good name. No word if they ever came to a settlement over the $25. In their defense, it’s probably hard for bellboys and clerks to behave when the management did not always set a good example. In 1913, proprietor Richard A. Von Falkenberg was accused of drastically raising the rent on a female tenant when she refused his unwelcome advances. Von Falkenberg proclaimed his innocence. Three months later, when the hotel was in, as the Los Angeles Times stated, "a precarious financial position," Von Falkenberg and his wife mysteriously dissappeared. Turns out, he was just suffering from ill nerves and decided to rest up in Ventura without notifying anyone. It is worth noting that just because someone was the owner of the Fremont, does not mean they were immune from the shadier goings on. In February of 1913, Fremont owner Mary Jauch (former resident of the Rose Mansion) reported $8,300 in jewels stolen from her room. The burgler had also entered the room of E.H. McElroy who caught the bandit red handed and the two scuffled until the theif got away. The antics of the Fremont Hotel abruptly came to an end in the mid-1950s as the building was an early victim of the Community Redevelopment Agency’s grand plan for urban rewewal. By 1955, all that remained at the Southwest corner of 4th and Olive was the retaining wall that a long time ago separated the Fremont Hotel from the Olive Public School. The Fremont Hotel that stood on the corner of 4th Street and Olive for five decades had 100 rooms. As previous posts on this site have shown us, no place on Bunker Hill with a lot of rooms and a long lifespan existed without a good amount mayhem. The Fremont is no exception. 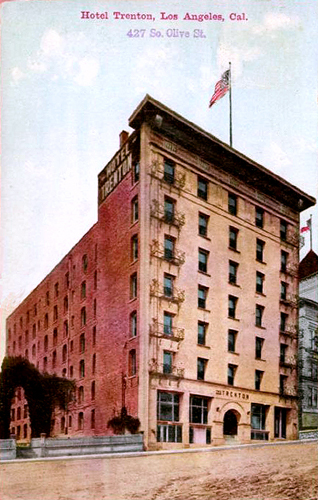 The Fremont Hotel went up in 1902 and was designed by John C. Austin, who would later make a permanent mark on Los Angeles by co-creating City Hall, the Shrine Auditorium, and the Griffith Observatory. Plans for the ritzy new hotel were announced in November of 1901, and other than a brief skirmish with the neighboring Olive Street School over the erection of a retaining wall, construction went smoothly. The Mission style building opened its doors to the public in September 1902. With so many residents floating in and out of the Fremont, it should come as no surprise that a few guests checked in and never checked out. Many residents who called the Fremont their final home were quite prominent. For example, Dr. Edwin West was a retired New York physician who settled in California when he found true love at age 79 and married his thirty-something paramour. It was the new Mrs. West who cared for the doc until he succumbed to illness in his room at the Fremont, and probably inherited his fortune. Then there was Harry Gillig, member of pioneering California family who was stricken down by a heart attack in 1909. Gillig was a onetime bridegroom of Amy Crocker, who we have heard about before. Finally, D.W. Kirkland, founded of the Owl Drug Company, lost a battle with pneumonia at the Fremont in 1915. Final exits at the Fremont were not always so peaceful. The note in N.H. Cummings’ pocket indicated he was suffering from ill health, which is why the Fremont resident jumped from a rowboat into MacArthur Park lake and drowned. Financial troubles caused oilman William W. Stabler to put a bullet through his heart. His wife discovered him in the office he kept at the hotel. In 1952 when John Swiston’s horse betting system failed him, he went to Lincoln Park and slit his wrists. He survived, and was able to returned to his room at the Fremont Hotel, and probably the horse track. were lent to him, and Aaron was held on $1,500 bail. Next, we have Mr. & Mrs. Griffith, who were married in 1887 and spent the next 16 years occasionally threatening to murder each other. In May of 1903, Mr. Griffth allegedly held his wife at gunpoint in their Fremont room and the ensuing scuffle was broken up by an unannounced visit from their son. 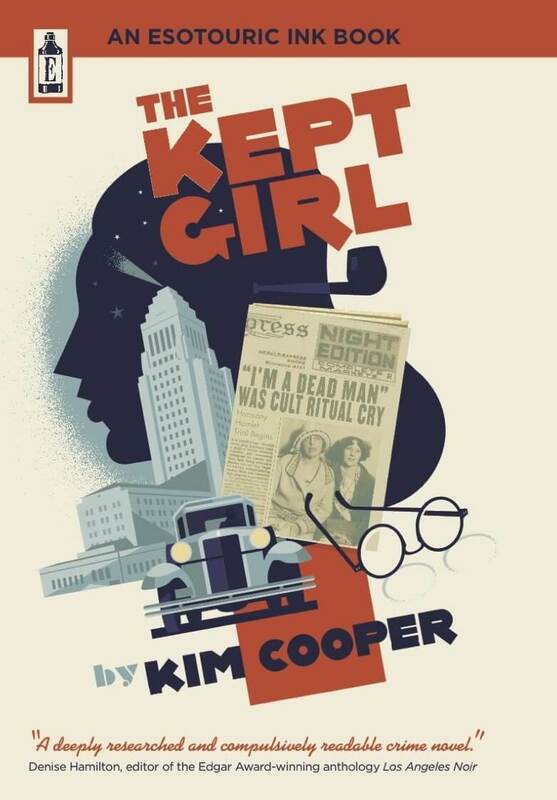 Four months later at a hotel in Santa Monica, Mr. Griffith went through with the dirty deed and shot the missus in the head. She responded by physically attacking him before jumping out an open window. Mrs. Griffith lived to tell her tale, and file for divorce. Col Griffith J. Griffith spent two years in San Quentin, having been convicted of attempted murder brought on by alcoholic insanity. 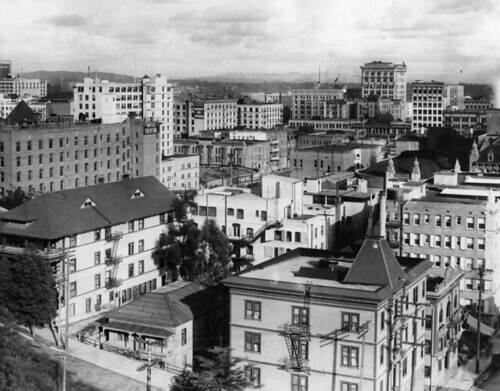 Back in 1896, Griffith had donated 3,015 acres of land to the City of Los Angeles. In 1913, he set up a trust fund to construct a couple of structures on the land. The land and buildings are Griffith Park, the Griffith Observatory, and the Greek Theater. The Fremont narrowly escaped a blaze when arsonist, George L. Gould was caught trying to set the place on fire. Police believed the 23 year old Gould to be the source of 20 fires started in the Dowtown area. One of the more bizarre incidents at the Fremont occurred in March of 1927 when George W. Fellows was arrested for broadcasting a radio program from his room. The problem was not the content of his show, but rather the length of the waves he was using to broadcast it, which exceeded regulations. Fellows responded to the charges by fainting in court. 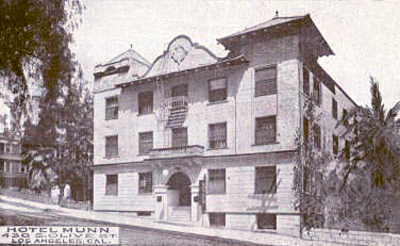 Walter Jackson gave A. J. Munn due pause, back in mid-aught four, when he approached Munn seeking a position at Munn’s hotel. (You can’t be too careful when hiring for an establishment that bears your own name, e.g., the Hotel Munn.) You see, Munn detected liquor on Jackson’s breath, but, some highly-placed hoteliers had recommended Jackson, so Munn engaged him with and on the distinct understanding that Jackson would foreswear liquor and gambling. Any On Bunker Hill reader knows the story won’t end there. Jackson was a gay and debonair fellow, and quickly rose to the rank of manager. But Mr. Munn began to have his doubts about Jackson as the hotel took in less and less money. Jackson proved to be a skilled tactician (and statistician) and evaded detection; it didn’t help Munn that the Jackson-hypnotized hotel residents declared they still owed accounts, when in fact they had paid them and secretly held receipts signed by Jackson. The Hotel Munn held a claim against the reporter for $48.15 ($1,094 USD2007) and Munn wrote the reporter’s mother in the East. After a long and patient wait, he wrote again. Oh no, said the mother, I immediately mailed you $50 to cancel the obligation. Thereafter Munn began digging in earnest and found someone to whom Jackson had issued a receipt for the money—uncredited in the books. With said evidence of cash appropriation, Jackson was summarily fired. Proprietor Munn was able to come up with shortage of about $100, and Mrs. Jackson, ever faithful, wired her own mother for the money. Then Munn agreed to take a note from Jackson for $200, due in thirty days and stipulating that no criminal prosecution would result provided the shortage did not exceed the amount of the note. Alas, as the matter became public around the hotel, a dozen or more guests came forward with receipts for money paid that had not been credited, and the shortage quickly jumped above $600 ($13,680 USD2007). Jackson is presumably less gay and debonair behind bars in County this morning. When the first reports came in about the 14-year-old boy lying drunk and insensible on the streets of Bunker Hill, he was over on Clay Street. But by the time Officer Broadhead went out to have a look, some boys had dragged him to a vacant lot near 4th and Olive, and it was from here that he was taken to receiving hospital. Once conscious, he proved stubbornly unwilling or unable to identify himself, answering "I don’t know" to all questions. He did, however, admit to attending the Olive Street School, and it is hoped someone will come forward soon to take this lost lad home.